See those? Those are pea greens! I hadn’t had them before, and so what’s a girl to do with new greens? Well, my first hunch is to saute them with garlic and olive oil… but it was breakfast, so they went into a smoothie! And look at the gorgeous spring green colour it turned! I know not everyone is in love with green (veggie) smoothies as much as I am, and that’s even a new-ish change for me since I was inspired by Meghan’s ebook of Green Smoothie recipes. But this one is really lovely and sweet, thanks to the apple, watermelon, and honey. And it’s nice and light too for an unseasonably-hot spring. If you haven’t gotten on the green smoothie train yet, you may want to start by just adding a leaf or two of your favourite greens (spinach? kale?) to your regular fruit smoothie. I promise, you won’t even notice it. But when you’re ready, give this one a go. It’s divine. Add all ingredients to blender and blend away for at least a minute. 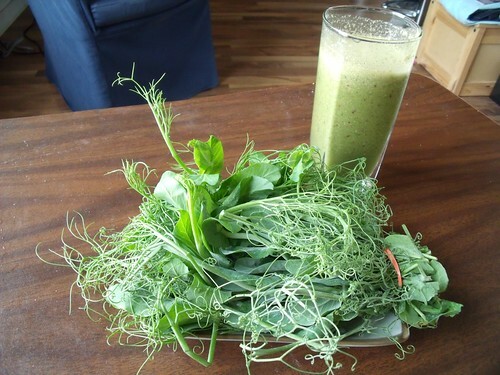 Feel virtuous that you’re getting your greens in your breakfast. Awesomely delicious looking! May I borrow this to use in the second edition release of the book? Thanks, Meghan — it’s due to your inspiration! Go for it, I’d be honoured to be in your second edition! A stunning & healthy smoothy, dear Lindsay! !